Give your curls some bounce with Goldwell Dualsenses Curly Twist Conditioner. Its nourishing formula adds strength and elasticity to your hair so curls appear visibly bundled, shiny and with extra life. You’ll learn to love your curves. Goldwell Dualsenses Curly Twist Conditioner provides luscious care for curls, improving combability and elasticity on a daily basis. 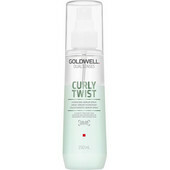 Specially developed with Curl System containing bamboo extract it visibly adds shine and bounce to your curly, wavy hair. Be the envy of all straight haired women with wonderful curls.